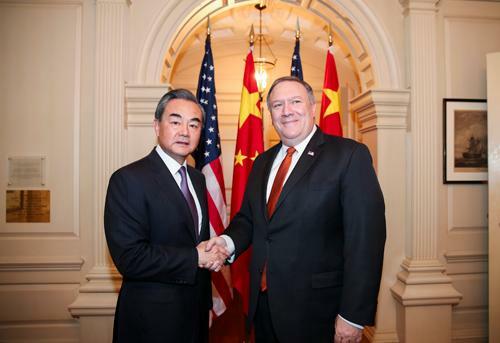 On May 23, 2018 local time, State Councilor and Foreign Minister Wang Yi, who made a stop-over in Washington, D.C. on his way back from Argentina, held a meeting with Secretary of State Mike Pompeo of the United States (US). Both sides exchanged in-depth views on China-US relations and issues of common concern. First, the strategic leading role of the two heads of state should be brought into full play to determine the development direction of China-US relations. Teams of both sides should earnestly implement the important consensus reached by President Xi Jinping and President Donald Trump, and at the same time, the two countries should well host the four high-level dialogues, strengthen strategic mutual trust, and reduce strategic misjudgment, so as to ensure the steady and long-term development of China-US relations along the right track. Second, bilateral mutually beneficial cooperation in a wide range of areas should be continuously deepened to ballast China-US relations. The nature of economic and trade cooperation between China and the US is mutual benefit and win-win results. It is hoped that both sides should speed up the implementation of the important consensus reached through economic and trade consultation a few days ago. Both countries should solve trade imbalance by doing addition rather than reduction, open markets to each other and protect intellectual property rights. Third, the differences and issues should be properly handled to pave the way for China-US relations. It is hoped that China and the US could meet each other halfway, respect each other's major interests, and manage, control and handle the differences in a constructive manner. The US side, in particular, should realize the severe harmfulness of those separatist forces advocating "Taiwan independence", and honor its commitments to adhering to the one-China principle and the three joint communiques between China and the US, so as to safeguard the overall situation of China-US relations as well as the peace and stability of the Taiwan Strait. Fourth, cooperation in regional and international affairs should be expanded to push for expansion of China-US relations. Both sides should strengthen coordination on such issues as the Korean Peninsula issue and the Afghan issue, promote the political settlement of hotspot issues, and deepen cooperation in affairs including counter-terrorism, cyber security, and combating transnational crime. Mike Pompeo said that the US and China are two major countries with important influence and also the top two largest economies in the world. US-China relations are of great importance. The two countries have some differences, but also enjoy enormous opportunities in expanding cooperation at the same time. The US believes that US-China relations should not be zero-sum relations. The US is willing to make joint efforts with China to promote bilateral relations for constant improvement and development. President Donald Trump cherishes very much the good working relations and personal friendship with President Xi Jinping, and looks forward to continuing to keep close communication and contact with President Xi Jinping. Mike Pompeo said that on the Taiwan question, the US side's stance of adhering to the one-China policy remains unchanged. As for the economic and trade issues, the economic teams of both countries have made constructive consultations not long ago. It is hoped that both sides will intensify their efforts to refine and implement relevant consensus, so as to benefit the two peoples. Both sides also exchanged views on the current Korean Peninsula nuclear issue. Wang Yi expressed that the essence of the Korean Peninsula nuclear issue is the security issue. China has always advocated that the US and the Democratic People's Republic of Korea (DPRK) should carry out direct dialogue and contact in this regard. China has always been paving the way and creating conditions for this. Wang Yi said that recently the deadlock that lasted for years in the Korean Peninsula situation has been broken, and we are embracing a historic opportunity to realize the denuclearization. We encourage the US and the DPRK to firm their determination to hold dialogue and realize the holding of the summit between top leaders of the two countries as scheduled, so as to prevent the positive changes in the Korean Peninsula situation from being interrupted again. China is ready to work with all parties to create a favorable environment and atmosphere to this end. Mike Pompeo expressed that the US speaks highly of the efforts China made on the Korean Peninsula nuclear issue, and thanks China for playing an active role in US-DPRK dialogue.